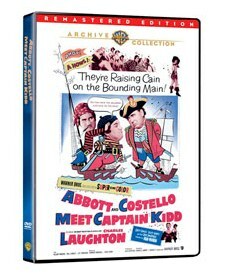 This release of Abbott and Costello Meet Captain Kidd is just outstanding. Over the years Abbott and Costello were on their adventures they managed to meet The Mummy, Frankenstein, and The Invisible Man ant not mention when they went to the planet Mars. I think this particular film is one that fans and really all of us have been waiting for. It’s one of the ultimate rare “grails” to the Abbott and Costello universe. One of the many reasons being is that it stars Charles Laughton paying Captain Kidd which is just genius. PURCHASE THE FILM HERE FOR ONLY $19.95!!! It is amazing to see Laughton playing this type of character because was well known for playing very “straight” and serious roles. 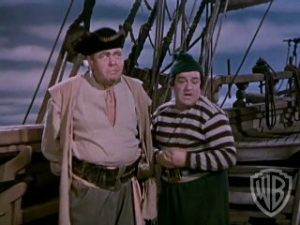 And fans of Laughton were just desperately wanting to see him play a foolish and hilarious pirate Captain. The results are magnificent and brilliant. And of course Bud and Lou are gold as always. Well I can say very proudly that this version is the best version of the film thus far. This disc has been remastered and is in 1.33:1 format which is full-screen. The sound is pretty decent as well. I mean you’re not going to get wide-screen or 5.1 super sound here. This film is not in hi-def, but it hasn’t been mastered for high definition yet. This is your simple DVD release. A release of a film from the early 50’s. Yes it has grain and pops, but I think for being a film that is almost sixty years old, this looks pretty amazing. Like I said, it is the best I have ever seen the film thus far. I want to praise the Warner Archive for releasing and remastering this long lost gem of a film. I really think this is a good sign to come in the form of maybe some bluray sets of old classics like an Abbott and Costello bluray set. How badass would that be? If you are a fan of film, Abbott & Costello, Charles Laughton, or have a passion for long lost amazing films, then this a must have for any lover of cinema or collector. Highly recommended. I smell a Charles Laughton movie marathon coming on. Bryan Deems ‘Super 8’ One Of The Best Films In Recent Years!!!! This entry was posted on Tuesday, May 3rd, 2011 at 9:01 pm	and is filed under Film, News. You can follow any responses to this entry through the RSS 2.0 feed. You can skip to the end and leave a response. Pinging is currently not allowed. « BRYAN’S BLURAY/DVD PICKS FOR THE FIRST WEEK OF MAY!! !